Recommend me a Hydraulic Bike Bench. Thread: Recommend me a Hydraulic Bike Bench. Finally going to get a hydraulic bike bench. I think I want a scissor action one so it rises and falls in the same position, rather than one with two separate arms which lay forward when down and swing backwards and up. Need to get a Guzzi Le Mans on which has a (crap) side stand or a centre stand, or Aprilia Tuono side stand only but I do have an ABBA paddock stand that fits centrally in the swinging arm pivot but is quite wide. Which might be too short, although I don't see a problem for the Guzzi, the back wheel can hang in the breeze when it's on it's centre stand. 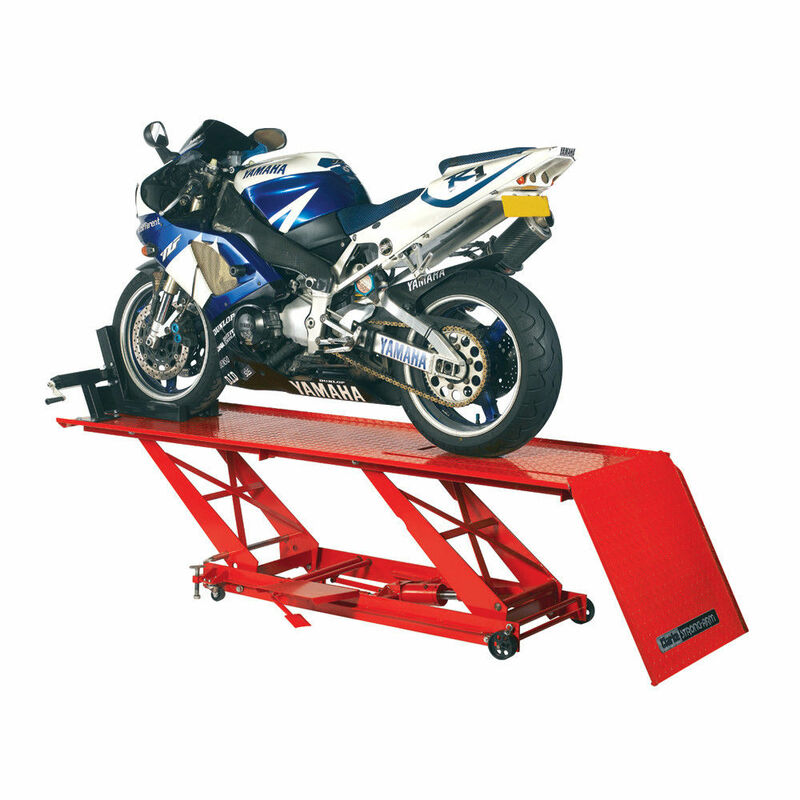 But it may be a problem for the Tuono unless it's on the ABBA stand, which may not fit due to the upstand along each side (similar for the Sealey as well I suspect. Re: Recommend me a Hydraulic Bike Bench. Have you considered the Abba Skylift? your bike is not on the list but neither was the Deauville I needed a fitting kit for, a quick call and they couldn't do enough to help. Not suitable for the Guzzi as it uses the swinging arm pivot, nor the DT which I didn't mention. I'm after one as well so timely post! I want one long enough to have the bike on front and rear paddock stands. The one in your eBay post I personally think is too short. I want a full length bench. Agree about scissor action also. Looked at those but not scissor action, May garage is tight for space with three bikes and three push bikes in plus other crap. I can cope with the back wheel hang past the end of the bench (rather the the removable ramp). My mate has one. It’s wobbly and looks cheaply made. He had a CB500 on it which isn’t heavy, I wouldn’t trust mine on it unless it was bolted to the floor. Could you sink it into the floor and then bolt it down? Cue jokes about Harleys, Gold Wings and the like. If it was bolted down that would help. But it’s not great. I’d prefer a scissor one. I have a real need now. Here you go - something like this? I want the table for rebuilding, not just a complete bike to be suspended. Think I'll go with the 2200 full length Clark lift. by the way FP - check which model your mate has got. This one has a 450kg payload and weighs 165kg itself..